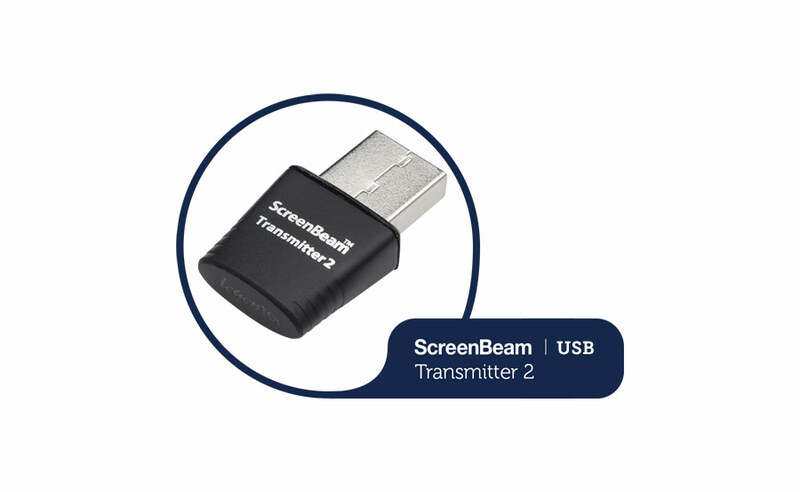 We are delighted to announce the availability of the ScreenBeam USB Transmitter 2! ScreenBeam USB Transmitter 2 enables legacy devices to connect to ScreenBeam wireless display receivers, so organizations and schools can optimize their current technology and take advantage of wireless display. When paired with ScreenBeam receivers, ScreenBeam USB Transmitter 2 increases productivity and collaboration by enabling real mobility. At ScreenBeam, we found that many employees and teachers are using Windows 7/8 devices while waiting for their organization or school’s tech refresh to enable wireless display. Now Windows 7/8 users can experience the benefits of wireless display without the wait — with the ScreenBeam USB Transmitter 2. Windows 7/8 devices with an outdated CPU, Wi-Fi or graphics cards that lack native Miracast™ support can use this external transmitter to connect a legacy laptop, tablet and desktop devices to a ScreenBeam wireless display receiver. Miracast technology creates a peer-to-peer connection between the source device and the display, allowing users to wirelessly display digital content from their device onto the big screen delivering a truly mobile experience. No longer tethered to the projector, you can walk around the room delivering your presentation, while interacting with your audience in real time. Added to that, our wireless display solutions cut meeting and presentation set-up time from 10 minutes down to 10 seconds. Plug in the ScreenBeam USB Transmitter 2 and with one click you can connect to the ScreenBeam receiver. You can quickly and easily set up your own meetings and presentations, letting IT focus on more important tasks. Compared to its earlier version, ScreenBeam USB Transmitter 2 has even a smaller footprint and supports 802.11ac when paired with a ScreenBeam 960 receiver. It comes with software that is able to support and deploy multiple laptops at a time and is specially designed to avoid channel interference. Once plugged into a legacy device, the intuitive software of the ScreenBeam USB Transmitter 2 automatically scans for a signal and allows you to select the cleanest 5GHz channel for a strong transmitter-to-receiver connection for maximum performance. The new ScreenBeam USB Transmitter 2 is available for purchase in the USA, Canada and China. Do you have Windows 7/8 devices you want wireless display enabled? Click here to learn more about our ScreenBeam USB Transmitter 2 or request a trial.